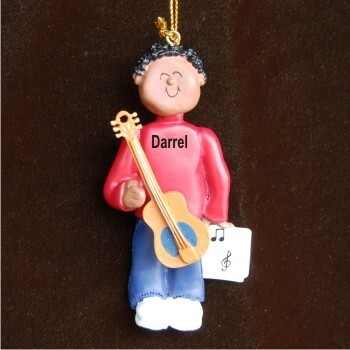 Beginners have a goal to aim for and successful guitarists have something to celebrate with the acoustic guitar virtuoso African American male personalized Christmas ornament. These stylish musical instrument ornaments personalized for the recipients come in other looks too, so you'll find one for each player on your list. An attractive cord offers easy display of the male African American acoustic guitar player personalized Christmas ornament that we deliver in our exclusive velvet drawstring bag.